A few weeks ago, I mentioned that I was heading to Fort Wayne, Indiana as a guest of the convention and visitors bureau. The anticipated highlight of the trip was time spent at the Vera Bradley outlet sale. I ended up buying 3 purses, 2 wallets and 1 large duffel bag for $122! And lucky for me, because we were traveling with the convention and visitors folks, we got to by-pass the lines at registration and at checkout. Oh...you're thinking I said "giveaway" in the title of this post, but I haven't gotten to the point yet? Sorry about that. I just got carried away with all the fun memories of sale shopping. So yes...I DO have a giveaway. To enter the giveaway, leave a comment on this post telling me what you would do with the Viva la Vera tote -- keep it, give it as a gift (to whom? ), etc. I'll use random.org to select the winner on Monday, May 2 and will post the winner here and on the Facebook page. Good luck! I would use it to look slightly more professional on overnight business trips. Last time I had an overnight trip I looked a bit un-put together. Oh no! I "liked" you a long time ago and I still like you! I 'like' your fb page and your blog is in my Google reader! I'm a teacher, so I'm always looking for strong, fetching bags to use. I'd use it for work and for my tutoring gigs. I'm heading to facebook to like you even more! Selfishly, I would totally keep it for myself. I would use it as a diaper bag. So pretty. Love the pattern. I love Vera! I would keep it and use it as my summer purse or a library bag or... I could think of a million uses for it! Super cute pattern, btw! My mom LOVES Vera Bradley purses. She's bought me at least 3 as gifts (or given me her hand-me-downs). It'd make a great (first grand)Mother's Day gift for her! MLLB: I would keep it all to myself. Really love the pattern. Let's see, I follow you via Google,& I "Like" you on FB! Now, I know what I would like to do with the bag. I would love to pack a bottle of wine, a swim suit, some sunscreen, and a good book and run away to a sunny corner of the world. In reality, it would be the perfect bag for finding matchbox cars and lego pieces in the bottom of when I clean it out! Oh, and I would probably carry baby stuff in it, lol!! i would keep it!!! i love vera, i have several bags, and i have been keeping my eye out for a bag to take all the notebooks and kiddy bibles to church in. the tote would be perfect for that!! i am so glad you fragged about this giveaway!! i missed it in my google reader!! Ok so I NEED this tote! Seriously! I just started a weekly blog hop type thing over at my blog about couponing and saving money and I've started keeping a binder and sprial with me that has my ads, coupons, notes, etc in it and this would be PERFECT to carry those things in!!!! FINGERS CROSSED! I already "like" you on Facebook as well! My mom LOVES Vera Bradley but I just gave her a lovely tote bag for her birthday so I think this one would have to be for me. I won't even feel guilty because I don't have any Vera of my own! With 3 kids I always have a TON to tote. I have been a follower of your blog for quite some time now. I am a facebook fan and chat with your frequently over there. I use my real name over there though. You know I am a Vera freak! I would love to add that to my collection! It would be the perfect tote to carry my calendar and work goodies. I also follow the blog - since the beginning! And follow you on Facebook!! oh i'm so jealous you got to go to this sale. how fun. if I won, I'd give this to my mom. she would be so excited. Well, I, too would keep for myself! Because I love Vera and I love your Blog. With such a cute bag to carry, I am sure many folks will comment on it and it will be my opportunity to tell them how I got it! I am a huge fan of both 4th Frog and your facebook...I wait with baited breath for your posts. I do not own a Vera and I never have, but I really want one. As the Mother of the Bride I truly believe I deserve it. Right now everything is about the bride and it should be all about me! I all ready subscribe to your blog...have since the beginning! AND I follow you on FB! And I have liked and followed you all over the place forever! I love Vera and haven't had anything new in a long time, so I would keep it for myself. I would tote my books with me every where I go! I am a follower...gotta go check fb to make sure I am there as well! I follow you on google and I'm your friend on Facebook. If I won the Vera bag I'd use it to carry books, magazines, my kindle and other stuff to the pool this summer! Ok, I am game Amy. My husband only gives what he thinks are practical gifts. A Vera bag would not be consider that. I am married to a man that has a meter that measure the amount of electric we use each day (he can check via the net while at work). So this would be a wonderful gift to give him to give to me for mothers day. Amy I admire you from afar because you are an excellent writer and have the greatest gift of gab. I totally love your posts! This year marks my mothers passing away 1 yr ago, April 8th to be exact. I have pondered what to do this year in her memory for Mothers Day. Last year although very rough we planted a red leaf maple and named it after her! She loved purses and I have several that I have kept while going through all her belongings. Each year in memory of what a great mom and grandma she has been we will dedicate something that she loved and what better than a Vera Bradley bag! To all moms out there that become daughters Best Friends, Happy Mothers Day! I just started following you after your guest post on Autism, a friend sent me the link. 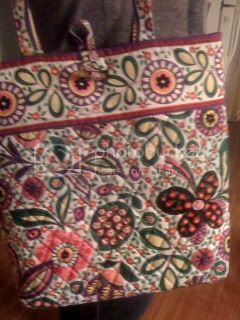 I don't have any Vera, and I would keep it, using it as a purse/diaper bag sort of thing. Yesterday was my birthday, and Sunday is Mother's Day. Well first of all, I love the pose the Annie is striking here!! And second, I don't think I can compete with Shelly's comment. But if I finally get a vera bradley bag or win anything at all... I would give it to either my mother (to get her some style) or my mother-in-law (which would be perfect for her books during her long doctor trips). Keep up the good blogging. Love Annie's pose! She is definitely model material with personality! I would keep the bag to carry around my small knitting projects that I make for kids who have been orphaned by AIDS in Africa. I'd totally flaunt it in front of my kids, who think that they deserve a new Vera Bradley tote/wristlet/lunchbox on a regular basis. Of course I already LIKE you...and like this tote as well, which would be my only Mother's Day gift, I'm sure, as lunch out is usually considered a (lame) gift by my family. I'd share it with my MIL, however, who lives with us (and doesn't that deserve a gift, too!). 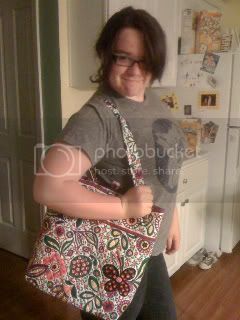 Amy--As a 4th Frog blog reader/follower/liker/etc., I am officially posting my "entry" for the Vera bag. (Which is weird... living in FW, surrounded by VB bags and all.) I own a few VB's, but I would probably gift this one to my mom for Mother's Day. I will save it for my mom. She always carries lots of stuff when she leaves the house and this tote seems to have the perfect size. Hi, I just subscribed to your blog. I also "liked" your Facebook page.